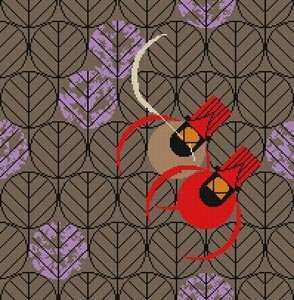 A Charley Harper needlepoint called Redbirds & Rosebuds featuring two cardinals amongst a field of leaves and flowers. The design is hand painted onto 13 mesh mono needlepoint canvas and measures 16" x 16". If you wish to purchase stretcher bars we recommend two pair of 20" and some thumb tacks.